If a dog is man’s best friend, fire is surely his best survival tool. According to archaeologists, we’ve been using fire for over a million years. We cook with it, hunt with it, and stay warm on countless nights because of it. There’s no telling where humanity would be today without the discovery of fire. But it’s safe to say; our survival would have been a lot harder. Today, fire remains and will always remain an essential survival resource. No survival backpack, bug out bag, get home bag or survival vehicle is complete without some fire tools. Whether it’s a survival lighter, a flint striker, matches – creating fire is an essential life-saving survival skill. Without it, things can get dark and cold quickly. And there are few fire tools as time-tested as the match. They’re simple and effective. But there are a lot of matches, made by a lot of manufacturers and for designed for different uses. Yes, they all produce fire, but some are far more reliable for survival than others. So how does one choose? The following guide goes over our favorite survival matches. And we’ll also share a few tips and tricks to make some survival matches all on your own. As A Way To Introduce You To Skilled Survival, We're Giving Away Our Ultimate Survival Gear Checklist. Click Here To Get Your FREE Copy Of It. Understanding how matches work is essential – especially if you’d like to try and make your own at some point. Despite the simplicity of matches, there’s a lot of physics going on when you strike a match. First, a match head and a striker strip are made of materials that react violently together. 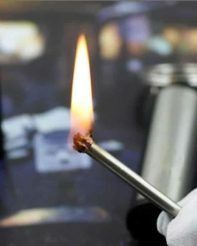 The match heads are comprised of potassium chlorate, sulfur, and powdered glass. The striker strips have sand, powdered glass, and red phosphorous in them. When a match head runs along a striker strip, pressure and speed combine to create friction. Friction is the resistance one surface or object when moving over another. High friction is high resistance, and high resistance creates heat. Friction is the heat generated when you rub your hands together quickly when cold. In fact, a match strike creates enough friction to ignite the incendiary chemicals in the match head. Those chemicals burn bright and fast. Hot enough to catch the matches wooden (or sometimes cardboard) “wick” on fire. Not all matches are created equal. Cheap, cardboard matches (the ones given away at your local liquor store) are far less effective than “strike anywhere” matches. These cardboard matches are meant for lighting cigarettes, cigars or tossing into firepits. That isn’t to say they are useless for survival, but they are not nearly as effective. They burn too fast, and not as hot, they’re less durable and much more susceptible to water damage. Even beyond the “strike anywhere” matches, there are better matches made explicitly for survival. These matches are called “stormproof” or “waterproof” matches because they’re water and wind resistant. When researching survival matches, there are a few options that stand out from the rest. But, they’re not always the first options to pop up on a google search. Nor are they options that can be found in any outdoor or surplus store. Which is why we have compiled this list of a few of our favorite survival matches on the market. These matches are at the top of our list for one simple reason: they are the best of the best. When it comes to reusable, waterproof survival matches, this is the one to buy. This match will burn far longer than your average one time use match. This gives you more time to light anything you need, using minimal supplies. Not only that, this match is 100% waterproof. This permanent survival match is good for up to 15,000 strikes. You can’t beat that. A specialty striker strip is also included on the match container. At the time this post was published, you could get this survival match if you pay for shipping ($9.97). Click here to see if this deal is still available. The Everstryke is not your typical match; it’s better. It’s made from stainless steel which means the Ferro rod is reusable for up to 15,000 long burning strikes! You almost never have to replace it. The Ferro rod is tipped with a steel bit. You strike it against a piece of flint built onto the outside of the container. A cotton wick that fits snugly through the end of the Ferro rod, so it takes only one strike to get an extremely hot flame! The strikes are measured at 3000 degrees Fahrenheit. And the flame sustains an impressive 600 degrees. When finished, just screw the match rod back into place inside the container. An O-ring built into the Ferro rod prevents fuel from evaporating when it’s screwed into place. And it also helps keep water out of the container. This metal match easily fits inside pants pocket or backpack pocket. It’s lightweight, reusable, durable, and generally, the perfect addition to any survival pack. The EverStryke Match an excellent upgrade and investment to your survival gear. Again, at the time this post was published, you could get an EverStryke Match FREE – just pay for shipping. Click here to see if this deal is still available. While the matches listed above are our two favorites, they aren’t the only survival matches out there. These are basic survival matches, but they do their job in a pinch! The packs come with 25 matches per (50 total) and a useful flip-top plastic container to keep them dry and protected. They’re also waterproof, windproof, and will light when wet. This kit comes with 25 matches and a durable, windproof plastic container and can hold up to 40 matches at one time. Plus this kit includes three replaceable striker strips. The replaceable striker strips are the most useful feature of these matches. Sometimes striker strips can get worn out after a lot of use, but that’s a non-issue with this survival match kit! Once your striker strip is about to kick the bucket, just replace it, and you’re back in business. The UCO Stormproof matches are also windproof and waterproof and will burn for up to 15 seconds. The case floats if you drop them in water. Also included (as a bonus) is a small ball of cotton, which can be used as kindling for an emergency fire. The Coghlan’s are affordable, reliable, and time-tested. The Coghlan brand has been around for a long time and is a favorite among the outdoor community. Hikers, backpackers, hunters, fishermen, and survivalists alike stand by Coghlan’s waterproof matches. One of the biggest advantages of this brand is they’re affordable. You can buy them in bulk. But, these matches do not come with extras such as a waterproof container. The mag chips, are an extremely useful survival resource for lighting fires. Magnesium lights easily and reaches temperatures of almost 900 degrees Fahrenheit. With a little pinch of magnesium, you can get just about any material burning, no matter if it’s wet or super dense. Of course, this match kit takes up more space than the other match options, but the magnesium is worth the room it takes up. You’ll be blown away by how quickly you can get a fire going with the stuff. The same logic stands true for survival matches. Buying stormproof matches is a step towards preparing yourself for a survival situation. But it only gets you what you buy. If you buy 50, then you’ve got 50, and when you run out of them, your luck is likely running out too. That’s why it is so important to understand how to make your own survival matches. If you know how to make your own survival matches, you’ll always be able to re-stock on them as needed. This is a valuable survival skill, and it’s easier than you might imagine. Get your hands on a box of basic “strike anywhere” matches and a wax candle. Simply light the candle and let the wax melt. Candles in jars are particularly useful for this since the melted wax can’t drip away or escape. Once you have got a good pool of wax, dip the match heads into the wax. Place the matches on top of the box they came in, with the waxed heads hanging off so that they can dry evenly. That’s it! This method is one of the simplest ways to waterproof your matches so they can be used even if they get wet. But keep in mind: these are not weather-proof or windproof. This technique does little more than keep moisture off of the match head before use. And in fact, you usually have to scrape the wax off of the tips before striking them, to get them to light. But in a wet survival scenario, this technique can be a lifesaver! Like the wax method, you’ll need to buy some strike anywhere matches and some shellac. Place the matches, head-down, in a small container filled with shellac. Let them soak. Once the matches are finished soaking, remove them, and place on a sheet of newspaper to dry. Allow the matches about 20 minutes to dry out before storing them in a container. Matches waterproofed with shellac will remain waterproof for several months. The advantage to this method, over the wax method, is you don’t have to remove the terpene before striking. They will ignite all on their own, given enough friction. Say you don’t have any candles or terpene on hand, and you need matches STAT. One way to waterproof matches in a pinch is to use nail polish the same way you used wax or terpene. Dip the head of your strike anywhere matches an eighth of an inch down into the nail polish. Then let them dry out, with the head hanging off of a table or the matchbox. Survival becomes a more difficult game without fire. Even crappy old matches are preferable to nothing. That’s why it’s vital to pack waterproof survival matches with your survival gear. Even if you’ve got a survival lighter or a flint striker packed, double down and add some survival matches as well. You never know when you’ll need them, or what you’ll need them for. Understanding how to make waterproof matches is also beneficial survival knowledge. Sure, having professionally made, expert-tested survival matches is a good thing. But you never know when you’ll be stuck in a cold wet survival situation, and need to keep your matches dry. Waterproofing matches is a simple process and one that could save your life someday. No bug out bag is complete without a supply of survival matches. P.s. Do you know where the closest nuclear bunker is from your home? There are a lot of natural nuclear shelters in the US that are absolutely free. And one of them is near your home. 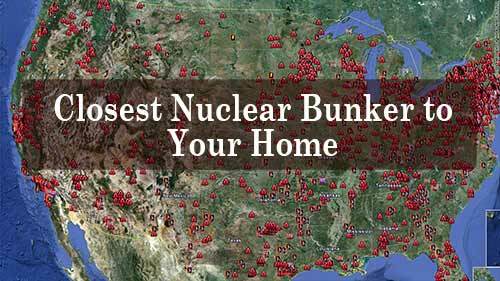 Click here to see the Closest Natural Nuclear Bunker to Your Home? Click on the image above to find out where you need to take shelter. Will Brendza is an American writer who spends most of his free time bogged down in fearless and wild wilderness adventures. He is a student of science, a lover of nature and a believer in Earthly stewardship. When he isn't involved with brave acts of reckless lunacy, he can be found at craft breweries, deep in the Colorado wilderness or nowhere at all.